Washington Bike Law believes in #VisionZero. Many people haven’t heard of Vision Zero, which is fine if they don’t have anything to do with transportation or law enforcement, but outrageous if they do. 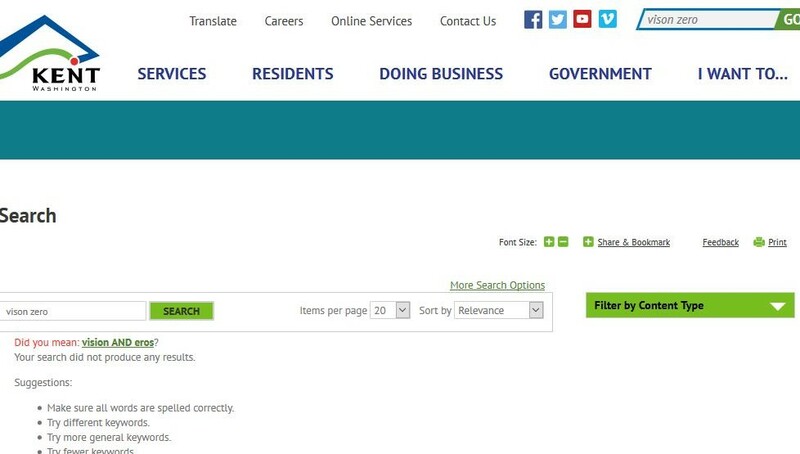 The website’s search asks, “did you mean vision AND eros?” Well sure, we’d LOVE for Kent to have shown a vision for safe streets, but alas, nothing is to be found… #ZeroVision. We represent a client who was seriously injured in Kent, Washington when he was stuck in a marked crosswalk. He is suing Kent for having Zero Vision– meaning in that case, not just that Kent failed to adopt Vision Zero, but that it failed to meet the bare legal minimum of having streets reasonably safe for ordinary travel. Our client was riding to work on the Interurban Trail, but had to cross Willis Street along the way. Unfortunately for our client (and others who use crosswalks there) the City of Kent was not thinking about Vision Zero when it designed the crosswalk where our client was struck and– apparently– others in the city. The city intentionally designed traffic lights to default to red for anyone using the Interurban Trail. Our client stopped and pressed what is sometimes called a Beg Button to get a green light to cross the street. Only after he had a green light did he enter the street. Traffic on 74th Avenue South, which is more or less parallel to the Interurban Trail, also had a red light. The driver who struck our client stopped for that red light and was in a right-turn-only lane with a separate signal. Drivers on 74th Avenue get a green light AT THE SAME TIME AS THE GREEN LIGHT FOR THE CROSSWALK. This is a “T” intersection. Traffic from this conflicting light could ONLY turn through the crosswalk with the conflicting signal. While this is obviously dangerous, the City of Kent claimed that it was fine even after we called their attention to it and asked them to make changes. By the way, if a municipality (or any defendant) makes changes after an injury due to its negligence, the fact that they made these changes (usually called “subsequent remedial measures”) is generally not admissible to prove negligence. This evidence rule is intended to promote safety, but the City of Kent apparently didn’t see it that way. From 2016 to 2018 Washington Bike Law wrote the city of Kent on six separate occasions asking them to please make changes. Pedestrians and bicyclists using the marked crosswalk after waiting for the green light are lured into a false sense of safety while right-turning motorists are also given the green light. Please let me know if the City has made any changes or, if not, if there anything I can do to convince it to do so before others are seriously injured or killed. The lawyer representing the city wrote back in October of 2018 stating that “the traffic signals comply with applicable guidelines and accident data shows the intersection is safe.” The City made no changes to this intersection or any other similarly dangerous intersection, despite our multiple explicit warnings. 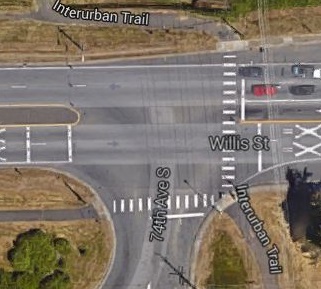 In November of 2018 a driver struck a woman pushing a stroller with two children in another marked crosswalk in Kent, killing the woman and injuring the children. The driver admitted that she saw another person in the crosswalk, but chose to turn anyway, intending to drive through the crosswalk in front of him. Instead, she killed the woman pushing the stroller, who was entering the crosswalk from the opposite direction. Of course, what these drivers did was negligent. But in both these cases, the people using the crosswalks and the drivers turning through them had green lights. Drivers have a duty to stop for people in crosswalks. But the real tragedy is that the City of Kent could have prevented this death and other serious injuries but chose not to act. This is Zero Vision. A recent article in the Kent Reporter by reporter Steve Hunter entitled “Seven Months, Seven Pedestrian Deaths in Kent” provides a sad overview of how dangerous Kent’s streets are for pedestrians. This was no accident. It was tragic that the driver chose to violate the law and drive into a marked crosswalk when she admitted that she saw another pedestrian in it. This was no accident. This death was the direct result of what I am calling Kent’s #ZeroVision policy. The City of Kent knew or should have known that their crosswalks were a trap for pedestrians years before our client was seriously injured in 2016. I can understand the defense lawyer’s point. But I wasn’t writing Kent so that I could write this now and say “I told you so.” I really wanted safer streets. What did they want? It remains to be seen what, if any, analysis the City’s traffic engineers did in our case. But the fact that so many people are still being injured and killed makes me think that the engineers should reconsider Kent’s #ZeroVision policy.